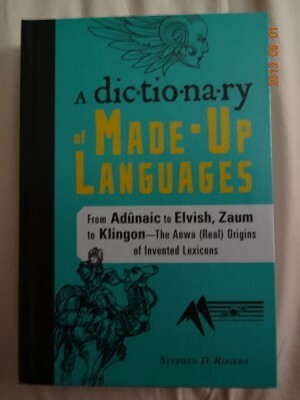 This book is just what it says it is: a dictionary of made-up languages. What this means is that there are dictionary entries in alphabetical order (usually a page, sometimes more) of made-up and artificial languages. Each entry has some or all of the following information: spoken by; documented by; behind the words (the background culture of the people/place the language is used); characteristics of the language; a taste of the language; numbering system; philological facts; if you’re interested in learning the language; for more information (usually a reference to the books mentioned in behind the words, web pages or to look at the general bibliography in the back of the book). There are two additional sections at the end called “Construct Your Own Language” and “Language Games.” The book has a one-page bibliography, an appendix of “Works, Languages Creators, and the Languages Associated with Them,” a glossary and an index. 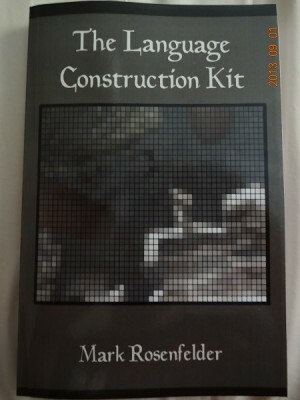 I bought this book at the same time I bought Mark Rosenfeld’s The Planet Construction Kit and The Language Construction Kit. For someone who had NO idea any of these languages existed (more than in just a passing reference), this was an eye-opening book. I only knew Klingon as an artificially-created language since I’ve always been a Star Trek fan. Of course I knew of the languages created by J.R.R. Tolkien for his Lord of the Rings trilogy, having read all the books years ago. There’s entries for: Newspeak from George Orwell’s Nineteen Eighty-Four; Land of the Lost, the 1970s television series that I loved, has an entry for Pakuni, which was created by linguist Victoria Fromkin for the Pa’ku, the primitive humanoids that inhabited the land, Ch’ka being the most prominent member; Harry Potter‘s Parseltongue and Gobbledegook; Earth: Final Conflict‘s Eunoia, spoken by the Taelons; besides Klingon, Star Trek‘s Vulcan and Rihannsu, the language of the Romulans (based on Old Vulcan); Gulliver’s Travels‘ Houyhnhnm (the civilized horses); Stargate‘s Goa’uld; Ursula K. LeGuin’s Kesh, and so many more. There’s also artificial languages created like Esperanto, which was created to be an international language. One critic on Amazon.com wondered why Tsolyani, created by Professor M.A.R. Barker for the role-playing game Empire of the Petal Throne and Novial, an artificial language created by linguist Otto Jespersen, weren’t included. Frankly, I think this is a great beginning in trying to document as many imaginary and artificial languages that exist. Second (and future) editions could only add these and other languages to the dictionary. This is an excellent reference. I hope to see it updated in the future. 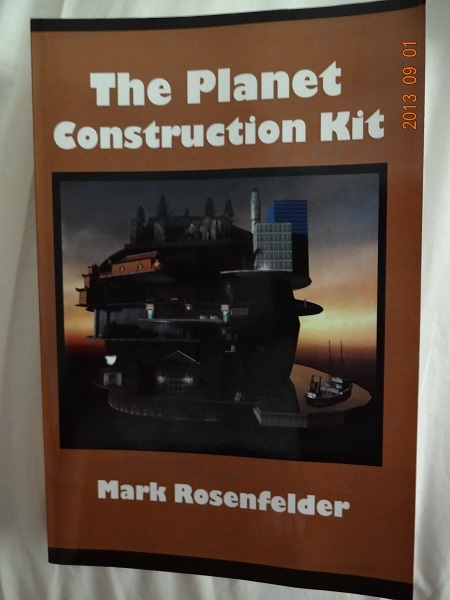 This book is related to another one written by Rosenfelder that I also reviewed, The Planet Construction Kit. I find languages fascinating. That said, I can only speak English; I have never been very good with foreign languages. However, if one is writing books or stories about different worlds or other places, it’s good to be able to create some type of language for the inhabitants, even if it’s only a naming language (a language that only consists of names on a map or some phrases). In Rosenfelder’s case, he’s created Verdurian and it’s many dialects. His site is loaded with translations of different languages. This book probably has more in it than most of us would ever want to know. Still, it is fascinating. In his introduction, Rosenfelder states that the book is not meant to be read straight through; someone interested in creating a language can look around and see what parts of the book are needed at that point. (This would be me, jumping from page to page.) The contents of the book: A naming language; The overall process; Sounds; Word building; Grammar; Semantics; Pragmatics; Language families; Writing systems; Kebreni; Word lists; More to read (the bibliography). Anyone interested in creating languages would find this book very interesting and very helpful, if only to give you ideas on how one goes about creating a language or languages. I found this book on one of my forays into the Internet. I was looking at books on artificial languages, and this was one of the books listed in the bibliography. So, I went out and bought the book and a few others. I wasn’t disappointed. For anyone who has ever made up races, languages and planets, this is for you. Rosenfelder’s web site (http://www.zompist.com/) is a plethora of information on languages, numbers, cultures–basically everything to give you information on how to construct an entire civilization. Rosenfelder discusses civilizations that he created on the imaginary world of Alemea. There’s a link from his web site to the different languages, cultures, religions, etc. on Alemea. When I was a child and a teenager, I used to create civilizations and languages all the time. I loved drawing maps of imaginary planets where these characters lived. Yes, it was fun to play with the Star Wars action figures, the Micronauts, and all the rest of the figures from different sci fi shows, but I liked making up new characters, civilizations and situations in which to put these figures. I still have the many maps I drew as well as the symbols I used for the languages. Of course I had no real understanding of the differences between languages. I didn’t even know that there were people out there doing the same things I was as a child and a teenager. I guess the Internet has brought like people together. As for this book, I highly recommend it to any geek who loves creating his/her own worlds and civilizations. I learned a lot from it.